After far too much complacency by all parties involved I was thrilled to see Representative John Lewis' remarks last week about the tone of the McCain/Palin rallies and their campaign. The most upsetting thing about his remarks is the response they have received by McCain's camp and most of the media. At the same time that images like the Obama bucks are mak ing their way into GOP publications and website the McCain campaign has the audacity to act the injured victim in this and denounce the honest words of John Lewis as "shocking and beyond the pale." 1) McCain cannot win this election without a strong turnout at the polls by the ugliest aspects of America, namely the racists and biggots of this country that are too ignorant and hateful to help themselves and their country move forward. 2) For every action Senator McCain takes to "rein in the hateful element at his rallies" Governor Palin gives as many if not more speeches that stir up that sentiment he is purportedly disagreeing with. 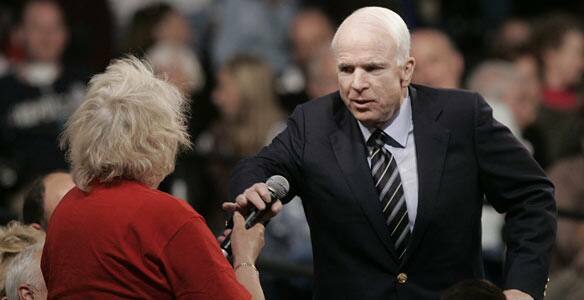 3) McCain's "denouncements" have not even denounced the racist tenor of his supporters. Case in point, when the slow witted woman in the red shirt stuttered through her idiotic comment about Senator Obama, John McCain's response was that Obama was not an arab and was in fact a decent man. He failed to address t o more serious problem with his supporters and their overwhelming belief that arabs are not decent people and are, due to their ethnicity, horrible dangerous people who do not love their families. So given these facts the climate of this campaign will only get worse and America should be ashamed of itself for treating 3.5 million of its citizens (who are of Arab descent) with this kind of hatred and distrust. It seems to me that if you're going to go after Senator Obama for having a fundraiser at Bill Ayers' house or for serving together on a board dedicated to reforming education then perhaps you should make sure that your own supporters don't own a bunch of white sheets and hoods. The fact that "McCain cannot win this election without a strong turnout at the polls by the ugliest aspects of America, namely the racists and biggots of this country that are too ignorant and hateful to help themselves and their country move forward," is something that is not mentioned by the news anchors or debated nightly by the pundits. Yet what you point out is very true...and pretty unsettling, to say the least (I am not shocked...but it's still pretty crazy). When I read your blog, I really wish that you were a guest on a show or a major columnist so that what you're saying would get on people's radars. Also, the constant discussion by the "mainstream media" and guests on their shows of Obama's having served on a school reform board with Bill Ayers - as if this fact somehow proves, at worse, that Obama is anti-American and supports domestic terrorism or, at the very least, has poor judgment - and their failure to devote the same amount of time to explain to audiences that the board was bipartisan and funded by Republican and McCain supporter, Walter Annenberg, is irresponsible. If we're saying that candidates are guilty by association and that all the beliefs and ideologies held by the candidates' supporters are a reflection of what the candidates themselves believe, then the media has a responsibility to go beyond beating to death the Obama-Ayers-Wright connection. How about the relationships McCain and Palin have with the people closest to them? Following Republican pundits' logic (and Rep. Michele Bachmann http://www.youtube.com/watch?v=eJIQm_7YAUI), Sarah Palin must be anti-American, unpatriotic, treasonous and must want Alaska to secede from the Union since her husband was a member of the Alaska Independence Party for seven years. And given Cindy McCain's ties to Keating and admitted drug theft from a charitable organization she started to support her drug addiction (see http://www.nytimes.com/2008/10/18/us/politics/18cindy.html), what does that imply about McCain and his judgment? So yes, perhaps the same zeal that the McCain camp has shown in trying to smear Obama and instill fear in Americans by linking him to Ayers et al needs to be applied to investigating whether or not some McCain-Palin "supporters don't own a bunch of white sheets and hoods." The sad thing in all of this? While news shows, pundits, and other guests are loving the topic of Obama's connection to Ayers - "domestic terrorist" who was involved in "deplorable" acts - there is no attempt to discuss Ayers' actions or the Weather Underground in any kind of historical/political context, explore the motives and reasoning behind the events that transpired in the late 60s and early 70s. But why bother doing something that might require an iota of intelligence...reflection...historical accuracy? Why educate Americans about their own history? Better to keep them ignorant. That way, Ayers remains the bad guy, the terrorist, and America, the land we love, is not made to account for her many acts of terrorism. Present viewers with a mini-lesson in 1960s-1970s American history and Ayers' actions may be understood in a different context and will probably start to pale in comparison with acts of U.S. aggression against its own citizens and citizens of other countries. That's never going to happen, though, right? So, no worries, McCain.